Not that it really needs a post, more for completeness (of what’s planned for later), here I quickly run through installing System Manager 3.1 (for Windows). *See http://support.netapp.com/matrix for the most up to date information. **This work is focused on CDOT. Note: By default (at least in CDOT 8.2.1), SNMP is allowed on the mgmt firewall policy (applied to cluster and node mgmt LIFs) for all IPs. Also by default, no SNMP communities are configured. 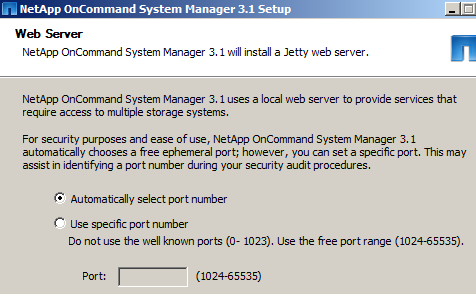 *The shortcut points to (default) "C:\Program Files\NetApp\OnCommand System Manager\SystemManager.exe"
Note: Even though OCSM opens up in a web browser, it is not available from outside the workstation it is installed on, since it only listens on the loopback 127.0.0.1 address. My FW is down. so then it isn´t block conections. I googlin for solutions but don fout about that error. Everybody talk about java version bun no about localhost.